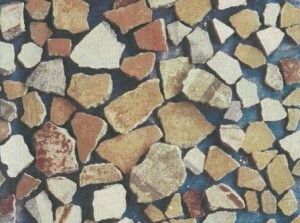 The mobile and web application e-Pedius, named after the Roman painter Quintus Pedius, supports crowdsourcing for the reassembly of wall-painting fragments. The restoration of wall paintings found at archeological sites is a very time-demanding task requiring years of manual work by professional restorers. Its difficulty comes from the large number of fragments, their abrasions and many missing pieces. The Jožef Stefan Institute and the Institute for the Protection of Cultural Heritage of Slovenia have previously developed an award-winning computer application for the digitization and reassembly of wall-painting fragments, however it is limited only to the professional restorers having direct access to the physical fragments. On the contrary, the e-Pedius application is available to all interested users of tablet, portable and desktop computers. Non-experts can use it to reassemble fragments into new compositions, continue the work of other users and rate the compositions. It is designed as a game in which the users gain points and achievements for their contributions, and are encouraged to collaborate with other users. The application development project started on September 1, 2012, and ended on August 31, 8. 2013. G. Čepin, T. Tušar and B. Filipič. Searching for similar unicolored fragments in crowdsourced reassembly of wall paintings (In Slovene). Proceedings of the 22nd International Electrotechnical and Computer Science Conference ERK 2013, Portorož, Volume B, pp. 73-76, 2013. T. Tušar, B. Filipič, E. Dovgan, B. Mahnič, G. Čepin, J. Kuret, P. Benedik, A. Mihailov, G. Berginc, D. Vladušič. Aplikacija e-Pedius za podporo množičnemu sestavljanju fragmentov stenskih poslikav. Proceedings of the 16th International Multiconference Information Society IS 2013, Volume A, pp. 122-125, 2013.